Face-Off: Bands With Two Lead Vocalists - Who Ya Got? Doug: Today's question doesn't require much background, so I'll cut right to the chase. This is a multiple subject Face-Off, by the way. Can you think of bands that had two lead singers in the group at the same time, or in some cases two singers who were perfectly capable of carrying the band? Got one or two in mind? 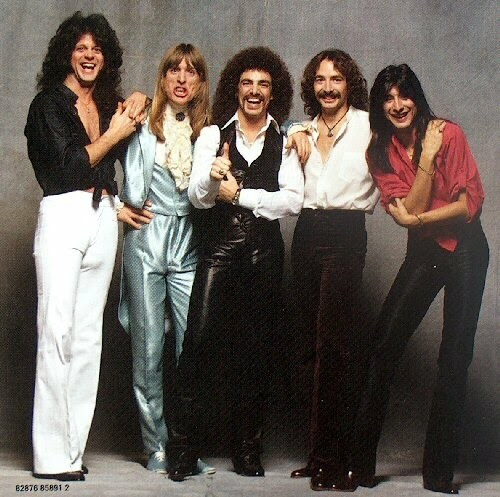 OK -- simply tell us which singer you preferred/enjoyed more on a given bands discography, and why. Have fun, and be sure to throw out some other favorite groups! Karen: I recently read a book about "hollow earth" beliefs -the idea that some folks have had that the Earth is actually hollow and that there are people living inside it -and the author listed a number of books and movies that utilized this concept, but no comics. The hidden land/race idea has permeated comics just as thoroughly as it has fantasy literature. The two examples I find the most interesting are the Inhumans and the Eternals. 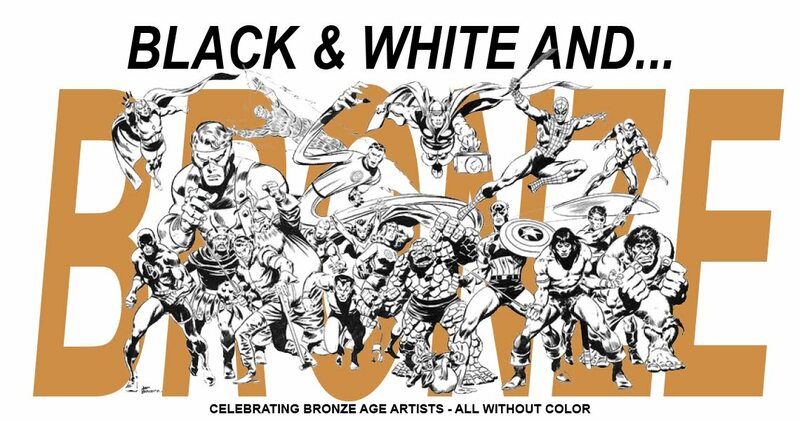 Since Jack Kirby created or co-created both of these classic Marvel hidden races, it's not surprising tha t they share many similarities. 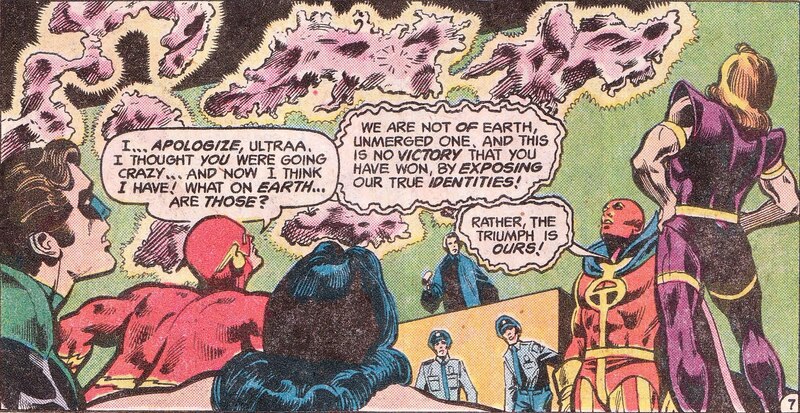 Besides being hidden races, of course, they are both off-shoots of humanity whose genetic destinies were altered by alien visitors: in the Inhumans' case, it was the Kree who did the deed, while the Celestials are responsible for the Eternals. Both have amazing powers, although the Inhumans have a greater variety of powers. Both also have sub-groups connected to them: the Inhumans at one time kept a slave race kn own as the Alpha Primitives (I believe that's been changed now), while the Eternals were eternally at war with the Deviants, an ugly, nasty group of genetic misfits. Neither group has really been able to maintain their own series for long. It seems they function best as supporting characters, providing a little more color and depth to the Marvel Universe. While I enjoy both groups, I probably give the edge to the Inhumans, mainly because of their connection to early Marvel and the Fantastic Four. 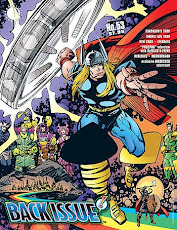 The Eternals, coming after Kirby's DC sojourn and his creation of the New Gods, seem more derivative. Does anyone have a preference on these two hidden races, or any thoughts they'd like to share? What is Canon in Your Comic Book Universe? Doug: Lately, our thoughts and discussions of this big event undoing that big event, this character dead... no wait -- he's coming back to life! is leaving me cold. In my mind, all of the recent trending toward disposable plotlines has left me asking myself just what is sacred to me? When did I basically shut the door on future changes to the characters I've been involved with for the past 40-some years? Today, fill us in on what you feel should be events that should never have happened, characters who should have stayed dead/never have died (shoot, how about should never have existed? ), and your general timeline for the end of "real" creativity. Yeah, this has a curmudgeonly bent to it -- but hey, it's OK to be crabby around here sometimes. 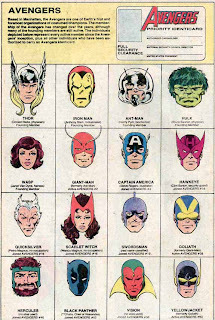 Below is the two-page spread for the Avengers roster, from 1985's Official Handbook of the Marvel Universe. I tend to think of it as a stopping point of sorts for me (although the presence of Tigra and Starfox don't enrich my life). Doug: The events of last week's post on 1981 and this one on 1982 are characterized by the rise of the direct market in comic book distribution. No longer were comics to be available only at drug stores and supermarkets. Now specialized "comic shops" sprung up around the country as entrepreneurs sought to capitalize on the hobby's increasing popularity. With that evolution, Marvel and DC not only continued to publish the short "minis", but expanded into what became known as maxi-series. Outside our windows, Argentina invaded the Falkland Islands (what the heck were they thinking? 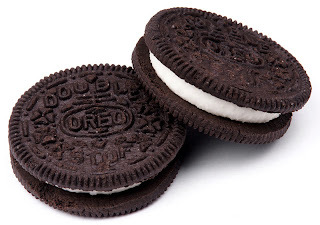 ), Disney's EPCOT Center opened in October, the same month Sony's personal CD player and the Double-Stuf Oreos debuted, and in December Michael Jackson's Thriller was released. And if that wasn't enough, a little film called E.T. was in theaters in 1982. And that aggravating Rubik's Cube became a fad. Karen: Speaking of comic shops, my first job was in a tiny (the term 'shotgun shack' would fit) mom and pop comic store. I think I started working there around 1981 or 1982. So consequently, i was reading a LOT of comics around this time, since I didn't have to pay for them! Still, I don't recall being all that excited by what I was reading. 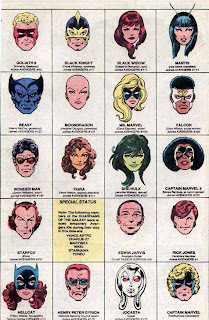 Doug: In last week's entry on 1981, I lambasted Marvel for sitting on their hands during that year while DC seemed to make most of the innovations, and further the momentum they were gaining through the mini-series and The New Teen Titans. I think we'll find that 1982 saw Marvel rise up and punch DC right in the mouth. Doug: In January Superman was featured in yet another mini-series, this time brought to readers by Steve Gerber and Gene Colan. Phantom Zone #1 delved into the history of the prison dimension. In the middle of New Teen Titans #16, the 16-page preview promoted Captain Carrot and his Amazing Zoo Crew, a funny-animal strip. Marvel wasn't goofing around with funny animals (although machinations were in place for the start-up of the Star Comics imprint), but instead launched its first direct-only title with Marvel Fanfare #1, featuring Spider-Man and the X-Men in an adventure set in the Savage Land. Yeah -- that would grab anyone's attention. The alien race known as the Brood also debuted in March in X-Men #155 by Chris Claremont and Dave Cockrum. And in case you thought Marvel was done, Cloak and Dagger turned up for the first time in Spectacular Spider-Man #64. With these three items, Marvel brought to the table elements that, at least to me, characterize the company in this particular era. Karen: At the time I was really excited about Marvel Fanfare. I don't think that enthusiasm lasted very long though. I still have several issues but I can't say I have gone back to read them in the last 25 years. I always felt the Brood were just an Aliens rip-off, and hated that they got used so much in X-Men. Doug: The spring months at DC saw a flurry of note-worthy activity. The Saga of the Swamp Thing #1 arrived with the intent of generating interest in the now cult-followed feature film, Swamp Thing. This series was received well, but really took off when Alan Moore arrived a couple of years into the run. In June, one of the victims of the DC Implosion returned to his own series in The Fury of Firestorm #1 by Gerry Conway and Pat Broderick. The same month saw the release of Tales of the Teen Titans #1, a four-issue mini-series that featured origin stories for Cyborg, Changeling, Raven, and Starfire. Karen: I recall getting all of those Teen Titan mini-series. It was such a novel concept then. Little did we know what it would turn into eventually! Doug: In the spring Marvel countered DC with some major events of its own. April's cover-dated Daredevil #181 saw the brutal murder of Elektra at the hands of Bullseye. The same month Marvel began publication of the Marvel Graphic Novel series. The first release was The Death of Captain Marvel, where Mar-Vell succumbed to cancer. April also saw the first-ever television ads for a comic book when the G.I. Joe cartoon hawked the comic of the same name, cover-dated July. 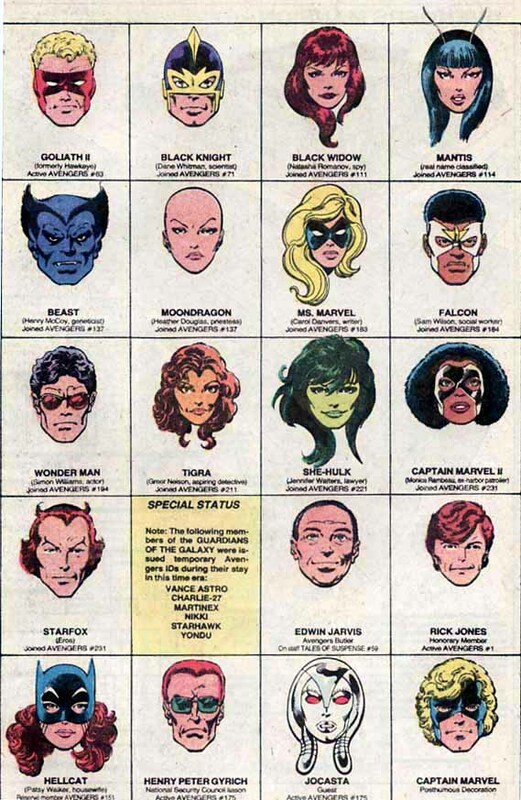 Marvel had licensed the use of the characters from Hasbro, at the request of the toy giant. 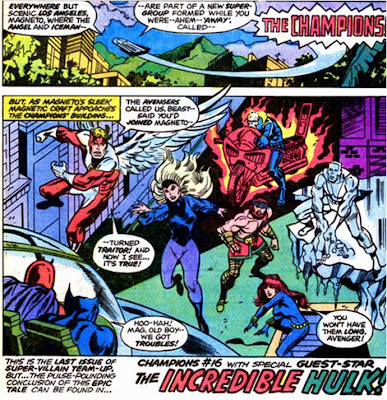 To close, the Contest of Champions mini-series came out after many delays. Originally imagined as a 64-page tie-in with the Moscow Summer Games, the project had to be totally retooled after the U.S. boycott. Karen: Lots of memories from those spring releases. The Death of Captain Marvel was especially notable for me, as I had been a fan of his Starlin days. It was so odd to have a hero die in bed -but a very poignant story. If only they could have left it at that! 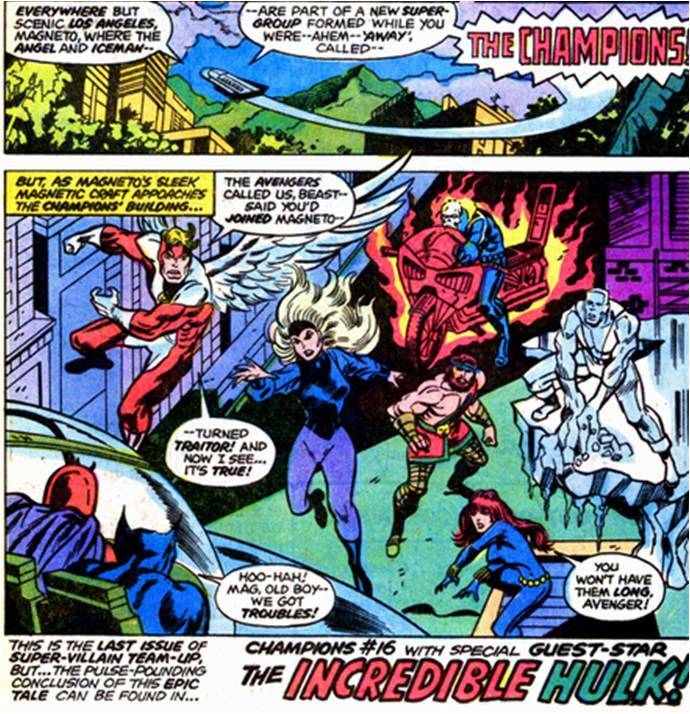 Contest of Champions was, in retrospect, pretty bad, but I've always enjoyed seeing lots of heroes together -this had the bonus of international ones. Doug: Brother Blood, who would become a major foe for the Teen Titans, first appeared in New Teen Titans #21 in July. In August scribe Paul Levitz and artist Keith Giffen began an epic when the "Great Darkness Saga" engulfed the Legion in LOSH #290. A month later, Starfire met her evil sister Blackfire in NTT #23. The big news from Marvel mid-year was the release of the Wolverine mini-series, by Claremont and Miller. If Logan wasn't already popular, he certainly jetted to the front after this story. Karen: I never warmed up to the Wolverine/samurai/ninja thing. But I was enjoying Teen Titans a lot around this time. Doug: In the fall, Marvel launched a new line called Epic. 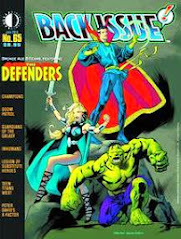 With the success of Epic Illustrated and the graphic novel series, Marvel was looking for a direct-only, creator-owned style that would be published outside the Comics Code Authority. The first title produced with the Epic imprint was Jim Starlin's Dreadstar. December was big, too, as Marvel Graphic Novel #4 featured the debut of the New Mutants. Again, like some of the happenings at the beginning of the year, when I think of the '80's, the New Mutants are there. Avengers fans can reflect on Amazing Spider-Man Annual #16, which featured the first appearance of Monica Rambeau, the new Captain Marvel. She was created by Roger Stern and John Romita, Jr.
Karen: Dreadstar was a title I really liked, and so was New Mutants. It still felt like Marvel was producing a wide variety of books at this point. Doug: As we close out the year, DC took the annual JLA-JSA team-up and stretched it to a five-issue story that began in Justice League of America #207 and included All-Star Squadron. Supergirl, still sporting the hot pants-look, got her own book in The Daring New Adventures of Supergirl #1. In November, Marvel and DC were at it again with the release of Marvel and DC Present: The Uncanny X-Men and the New Teen Titans #1, by Chris Claremont and Walter Simonson, the book was printed on Baxter paper and priced at $2. I got a copy of this a few years after its publication, and it was pretty good. I don't know where I'd rank it among the other company crossovers, but it was exciting to see these two teams together. In December, DC's first maxi-series began publication with Mike W. Barr's and Brian Bolland's Camelot 3000. I've not read it, but as a fan of Bolland's work I'm not sure why I've never made the effort! Karen: Unfortunately I never had a complete collection of Camelot 3000. I really enjoyed the artwork by Bolland though. I think this was the first comic I read that had a gay character in it, too. At the time it seemed really progressive, even if it was a woman who hated being a woman and wanted to be a man! "While a World Lies Burning!" Karen: When you think of Batman, I'm sure many words come to mind: capable, resourceful, confident. He's not someone who seems lacking in self-esteem. Which is why I find this issue of Justice League so dog-gone interesting. Because here, in this pre-Dark Knight book, we are presented with a Batman who *shudder* doubts himself! Our splash page shows the caped crusader staring at monitor screens showing the world on fire and declaring, "What can I do, without super-powers? Lord, I've never felt so helpless..."
Karen: Yeah, that's a hard one to comprehend. Batman, helpless? Unlikely. Even worse, admitting to feeling helpless? Never! So one might ask, was this a contrived behavior from the dark knight detective, or have we, in recent years, come to view Batman as so utterly invincible and arrogant that this scene seems ridiculous? Was Batman more, well, normal back in the 70s? Since I wasn't a regular reader of DC titles then, it's hard for me to say. But Batman, as presented in this story, sure seems very human. Disturbingly so. Karen: The first two pages of this issue show our troubled Batman trying to figure out how to save Earth; next we switch scenes to our planet, specifically the United Nations building in New York where the Justice League is on trial for holding a hero called Ultraa against his will. Ultraa is called to the stand but suddenly attacks his lawyer, who turns out to be some sort of weird alien colony creature that plans to take over the planet. Karen: The creature claims to have already killed Superman -"he lies dead beneath the sea" - and he knocks out Flash. Ultraa and Red Tornado pursue the creature, while Green Lantern takes Flash to the hospital, and Wonder Woman goes to find Superman. I thought it odd to see Diana was still using her invisible jet. Karen: The aliens are apparently causing the planet to heat up. Batman has figured this out, and puts on a space suit and heads off on a space cycle for some mysterious destination. 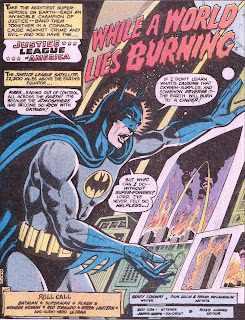 Meanwhile, we have a montage of all the other Leaguers working to put out fires, but as Batman says, they are fighting the symptoms, not the disease itself. Karen: Wonder Woman finds Superman in the Atlantic. She recovers him, and at first she fears the worst. But he's still alive, although in bad shape. He has figured out what the aliens are doing to the oceans. I found it odd that Wonder Woman called Superman 'Kal'. Was he really into his Kryptonian heritage back then or what? Karen: Meanwhile, our self-doubting Batman has reached a mysterious asteroid orbiting Earth. it turns out it is really the aliens' spaceship. As he enters the spaceship, Batman thinks, "The computer gave me strict instructions on what to do here. Now if I can just find the propulsion units..." Wait a minute. The computer told him what to do? This just doesn't sound right. Karen: Meanwhile, Wonder Woman, Red Tornado, and Green Lantern regroup. WW explains that the aliens are stealing hydrogen from Earth, using electrolysis on the oceans, which is why the fires broke out, from excess oxygen. Okaayy...now it has been many years since my last chemistry or astronomy class, but I seem to recall that hydrogen is the most common element in the universe. Surely aliens with craft capable of crossing interstellar space could find easier ways to get hydrogen. But it's not a science lesson, I know. 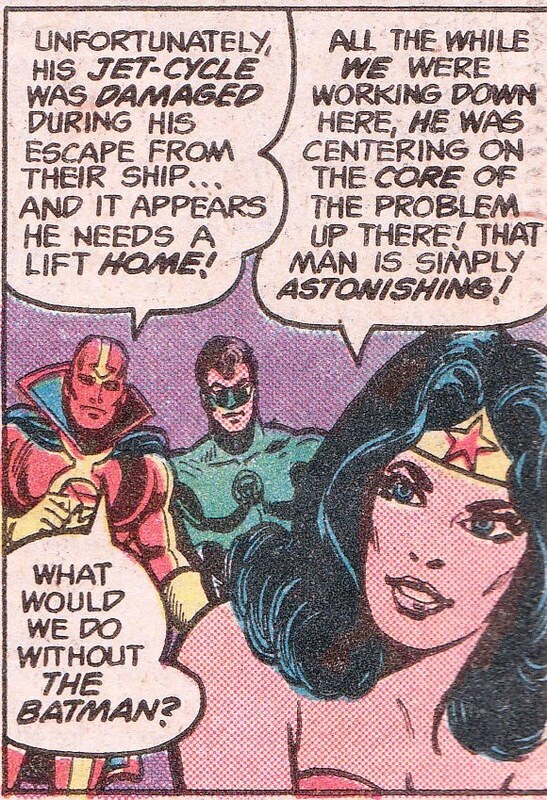 What's more disturbing is that GL just off-handedly remarks that his ring can reverse the electrolysis process and starts blasting the ocean! H e causes a massive explosion. 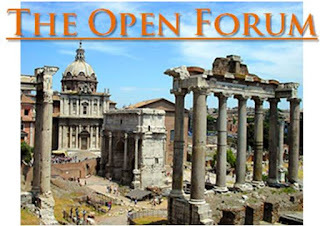 The trio discover Ultraa and the ruins of the alien base. GL has apparently accidentally wiped out the aliens, but no one seems to care much. Karen: Suddenly there is a bright explosion in the sky above. Red Tornado gets a call from Batman, who has sent the alien ship hurtling out into space, but his space cycle is busted and he needs a lift. 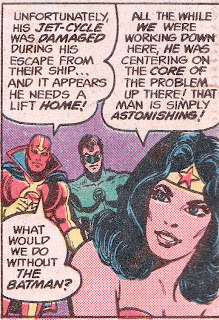 Wonder Woman says, "All the while we were working down here, he was centering on the core of the problem up there! That man is simply astonishing!" "What would we do without the Batman?" 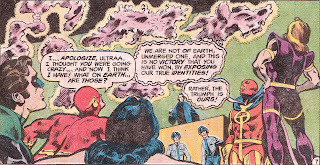 Red Tornado says. Karen: It's a pretty simple story, not one that really holds up under close examination. The a rt is great -Dillin is always who I think of when I think JLA. But this whole issue with Batman not feeling good enough to deal with the problem -and having him use the computer to tell him what to do -just feels so wrong. I know he wasn't always the arrogant demi-god he is today, but I still have a hard time seeing him doubt himself so. I wish I had some follow up issues to see if this idea was continued, or if it was simply a throw away. 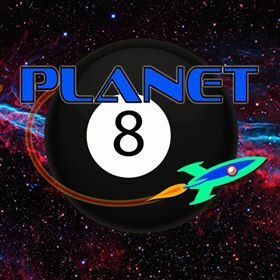 "A World For the Winning!" Doug: Hi, kids -- here we are with a second chance for Super-Villain Team-Up. If you recall, the last time we visited this book, the Herb Trimpe art was only slightly worse than the Steve Englehart words. So it's only fair if we check in again a bit later to see if the series improved. Additionally, this one's a two-parter with a fave 1970's book of ours, The Champions. So buckle in, and stop back by next Monday for the conclusion. Karen: Before we get started, I have to say, I've always loved that Byrne/Austin cover! Doug: We open on the streets of Latveria. It cracks me up that everyone is always in traditional native costume -- or at least look a few decades out of time! 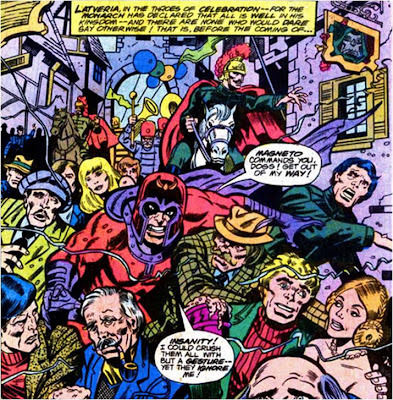 Magneto, in full costume, strides the capital byways, looking to cause some trouble. He has come to Latveria to meet Doom -- but can't seem to get to Castle Latveria. The monarch has decreed that all in the kingdom must celebrate his victory over the Red Skull in the previous storyline. 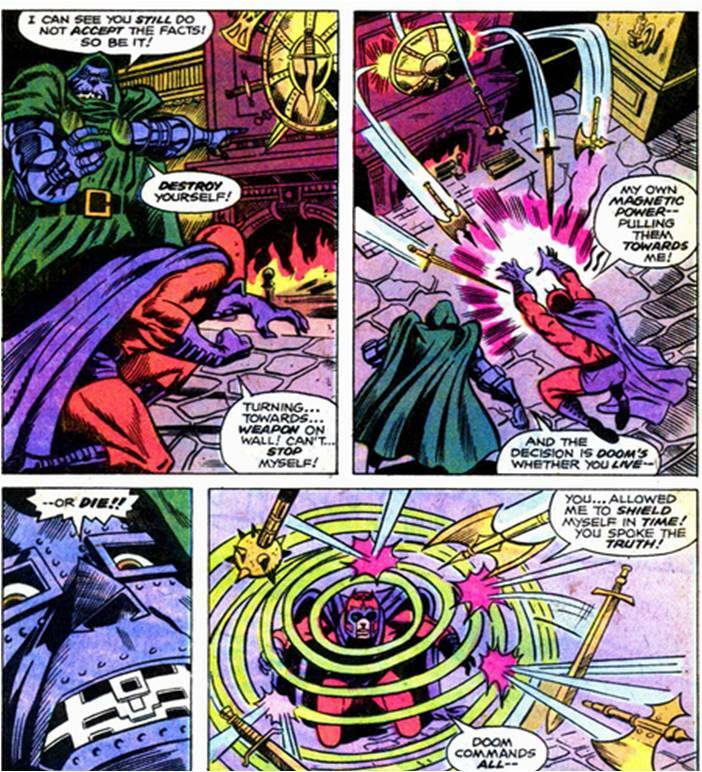 Magneto, quite put-out by the lack of attention, succeeds in toppling both Latverians and an enormous statue of Doom. 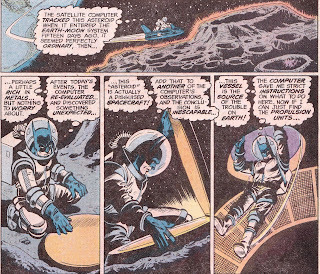 Then he takes to the magnetic waves (yeah, whatever that means -- this story will require a suspension of disbelief in regard to the realm of physics) and rides them toward Doom's domicile. Karen: You know, I never even considered how ludicrous those 'villagers' looked until we started doing reviews. Between Marvel and the old Universal monster films, I guess I'd been conditioned to think that all small towns in Europe looked like that! Doug: Inside the castle, Doom gloats over a plan that Reed Richards knows nothing of -- a plan that's already been executed. 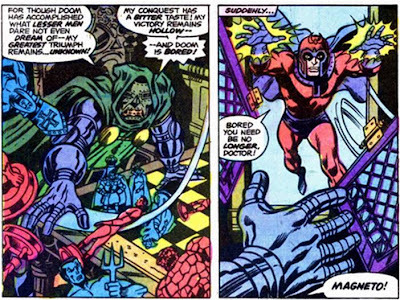 Suddenly Magneto bursts in through a window, and seems surprised that Doom recognizes him. Say what? Why would Bill Mantlo write such a thing? I thought it was silly -- even in real time, the Marvel Universe would have been 16 years old -- Marvel time, that's at least probably 6-8 years. And Magneto thought someone of Doom's caliber wouldn't have known him? He's further amazed when Doom asks him to recount his recent rejuvenation from his infant state. Magneto's somewhat humiliated, but ends his story by saying how the X-Men ran from him. Not quite the way we reported it here on the BAB! Karen: Hmmm.... is this actually the first meeting between these two? I can't think of another before this, not off-hand. But then, I haven't read every 60s and 70s Marvel comics. At this stage, Magneto was still not raised quite to Doom's level as a top tier villain. But he wouldn't have to wait long. Doug: Doom reveals his plan -- cannisters of neurogas have already been released into the atmosphere, essentially making everyone his obedient slave. To prove himself, he works Magneto like a puppet. After enlisting his friendship, the two toast. But Doom has laced Magneto's goblet with a drug that knocks Magnus out. He next finds himself on the streets of Latveria. So, thinking that if he himself is to conquer the world, he's got to break Doom's grip. 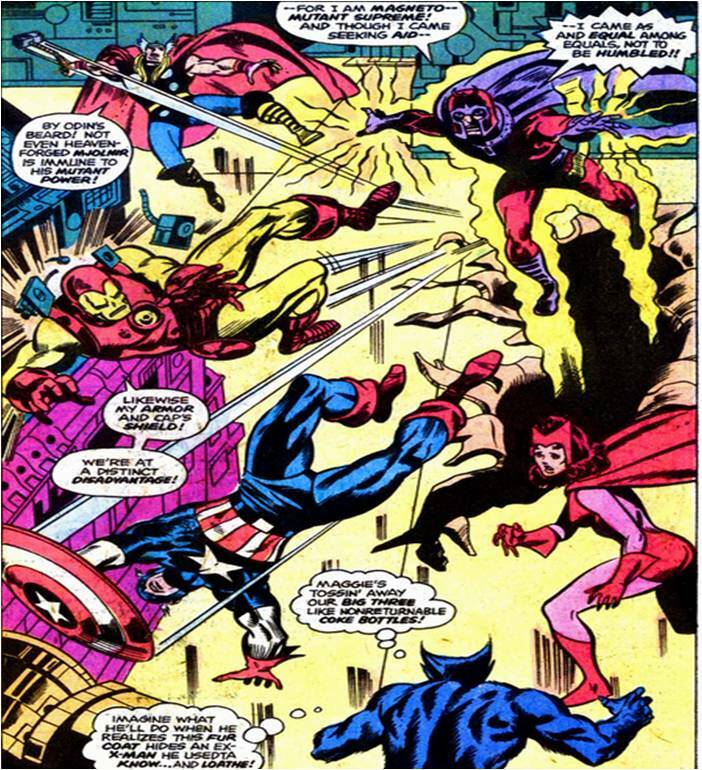 So he does what any of us would do -- he goes to Manhattan and attacks the Avengers! Karen: I suppose even if Magneto had knocked politely, there was a good chance the Avengers would have attacked him! 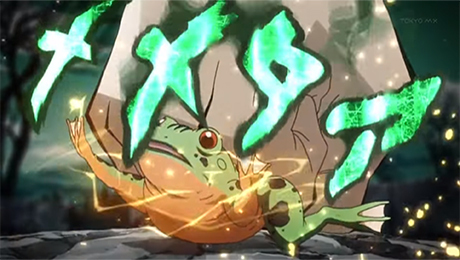 But yeah, this is definitely the 'obligatory fight scene'. Still, I enjoyed it on some level. 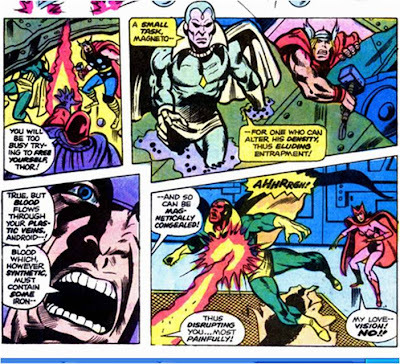 Doug: It's a four-page conquest, but Magneto makes quick work of the Avengers. I found it odd that the Vision could be subdued so easily (really -- synthetic blood would have iron in it? 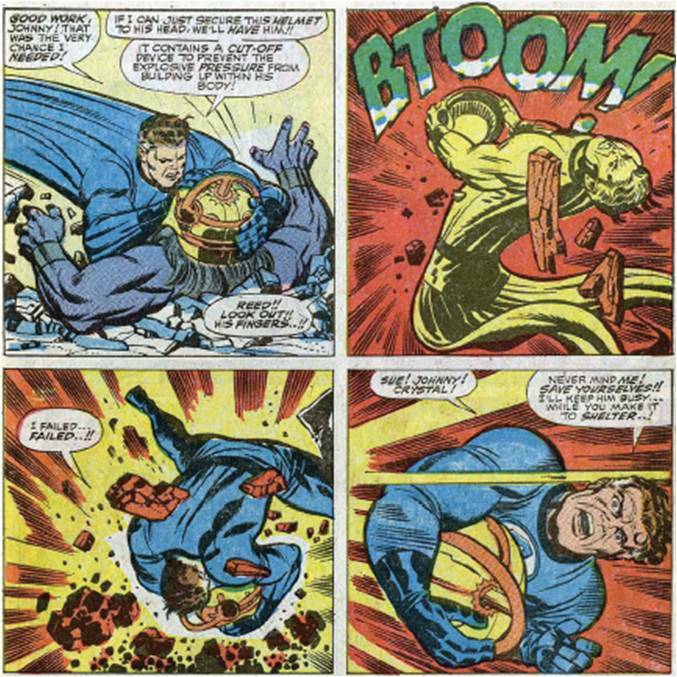 ), as could the ionically-powered Wonder Man. Oh well -- guess it was necessary to the plot. 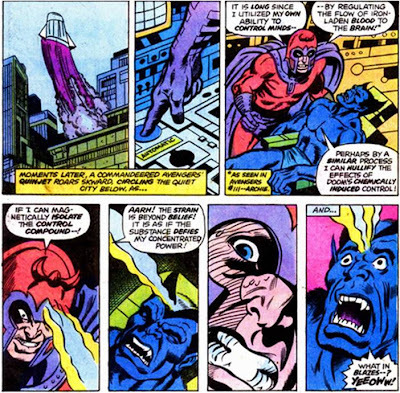 Then to prove his point, Doom holographically appears in the middle of Avengers Mansion and, using the effects of the neurogas, forces the Avengers to bow to him. Then it gets even more unbelievable. 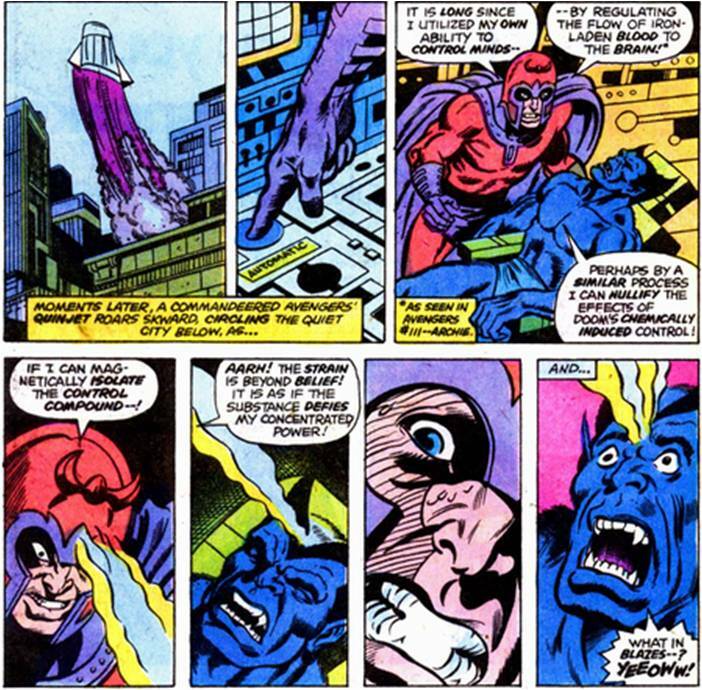 Magneto decides that the Beast can aid him in allying with other heroes who can bring down Doom. He takes the Beast to a quinjet, and then magnetically affects the iron in Hank McCoy's blood, controlling his brain activity in a bid to negate the effects of the neurogas. That's right -- why didn't you think of that? Magnetic mind control. Oh, and in case you thought Mantlo made that up, go back and check Avengers #111 -- that's when Mags did this to the Scarlet Witch. Karen: Although I like the idea of the neurogas and the whole subversive nature of it, I have a hard time believing that beings like Thor, the Vision, and Wonder Man could succumb to it. But if I was Magneto, I do think I might have chosen Thor or maybe Iron Man instead of the Beast as an ally! Doug: After striking out at the Baxter Building and at Westchester's School for Gifted Youngsters, the Beast decides that they have one more shot at help -- Los Angeles and the Champions! So away they go; I'll bet the conversation on that cross-continental flight was fun! The note at the bottom of the last story page states that this is the final issue of Super-Villain Team-Up (although I did have issue #15, which was a reprint of a Doom/Red Skull battle), and up until a couple of years ago, I thought that it was! But lo and behold, there were actually more issues -- over the next three years! I have no idea why it became so sporadic. Does anyone else know? Doug: I've intimated that Mantlo's script leaves a bit to be desired. He has all of the proper speech patterns down for the most part; I thought the plot was just silly. As we mentioned back when we looked at this book before, it just seems to be written like some monster movie from the 1930's (and don't get me wrong -- I liked those!). And what of the art team? Well, it's a huge improvement over Trimpe's output earlier. But Perlin's and Vohland's inks tend to be heavy, as I've seen Bob Hall look better than he shows here. So, cancellation? Even though I was fond of this book as a child, I'm feeling that it for the most part doesn't "hold up" on the re-read 30+ years later. Other opinions? Karen: Mantlo seemed to get put on a lot of titles in the late 70s/ early 80s, but while he usually did a good enough job, I can't think of anything that knocked my socks off. But with SVTU, I think it's a very limited concept to begin with, and not necessarily an easy task to keep it both interesting and making sense. While I enjoyed this as a kid, I would agree, reading it now it has been somewhat disappointing. Happy Easter From the Bronze Age Babies! We hope you find all of the eggs! Doug: Hey, it's been quite a few months since we tripped back to the Silver Age via our favorite Bronze Age reprint series. Last time we checked in on the Lee-Romita Spider-Man through Marvel Tales; today it's Marvel's first family and their allies versus Negative Zone Super-baddie #2, Blastaar! Doug: This is one long slugfest! The story begins with the FF returning to the Baxter Building from the rescue of Reed. He had been lost in the Negative Zone and had been saved by Triton. While the team assembles, the roof begins to fall in -- literally! There are heavy blasts taking place, so Reed stretches through a hole in the ceiling. He's rebuffed by a concussive blast, and as he falls mutters that the explosions come from "his fingers". Triton grabs an air gun and blasts to the rooftop. He's greeted by a gray-haired menace calling himself Blastaar, and the Sandman! This is the Sandman I like, in his "battle suit". After Triton is dispatched by a combined effort, the Sandman scoops up Blastaar in a huge fist and they -- get this -- walk down the side of the Baxter Building! I'll have to say I was surprised at this visual -- I really wonder what Stan thought when he saw the panel. He dialogues it with an excuse, that the Sandman used chemicals in his belt to mix with his sandiness to create "adhesive sand". Still, the muscle control it would take to pull this off... well, that's Kirby's imagination for you! Doug: Once on the ground, who should show up but Johnny and Crystal. Of course the police have gathered to arrest the Sandman, but it's Blastaar who attracts the attention. Naturally Johnny can't stay down, so he attacks. He proves to be pretty ineffective, so it's Uncle Benjie who arrives to save the day. Kirby had to have a blast (no pun intended) with this story, because it's just a chance for him to cut loose. Ben and Johnny do their best, but really operate at break-even with their adversaries. 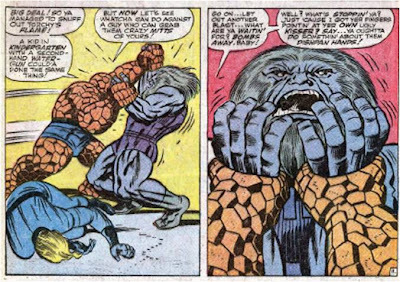 Highlights of the segment of the story include Ben gripping Blastaar by the wrists, turning his hands toward his own face and daring him to blast. In a panel on the next page, he says, "Just in case ya lost yer wristwatch or somethin', I'm gonna show ya what time it is... 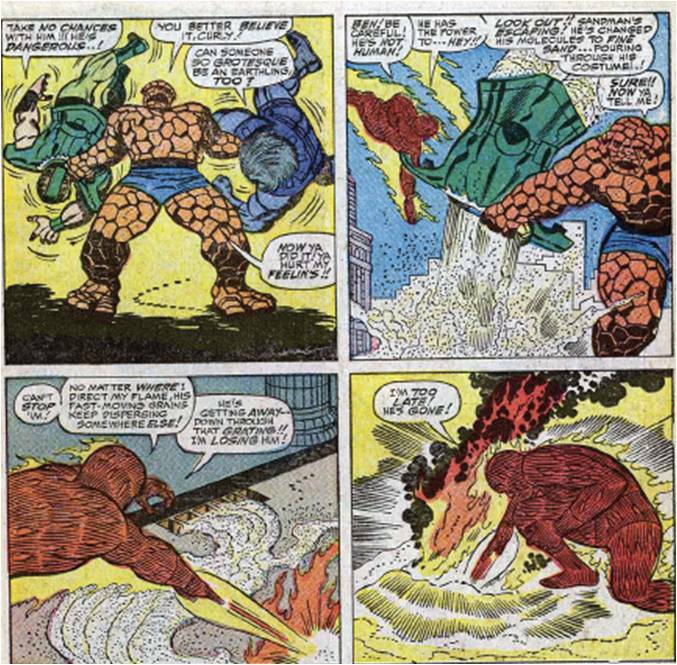 It's Clobberin' Time!" Classic. Doug: So where are Reed and Sue? Upstairs in the lab, trying to get Triton healed up. Of course, Reed has the obligatory vat of water (you may recall our review of Super-Villain Team-Up #5 and a similar situation involving Namor) and some "healing balm" to fix up their Inhuman ally. Watching the battle in the streets on a viewer, Reed suddenly bursts out of the room and into a closet, feverishly looking for a device he was working on before the Negative Zone adventure -- keep that in mind, before. Doug: Johnny recharges, and Ben comes back after besting ol' Sandy in the river. At about this time Reed and Sue arrive with the device Reed was looking for and had to quickly finish -- a helmet that dampens a persons ability to make concussive energy blasts! How totally convenient!! Well, he gets it on Blastaar once, but is rebuffed. With one more fleeting chance, Reed manages to secure it. 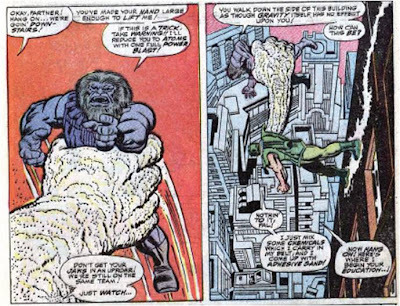 But then, rather than figure out a way to depower Blastaar or hook him up to some major-league prison, Reed instead tells the team that they are going back to the Negative Zone portal to basically throw him back! Say what?? Yep -- throw him back. So he can getcha later. Duh. 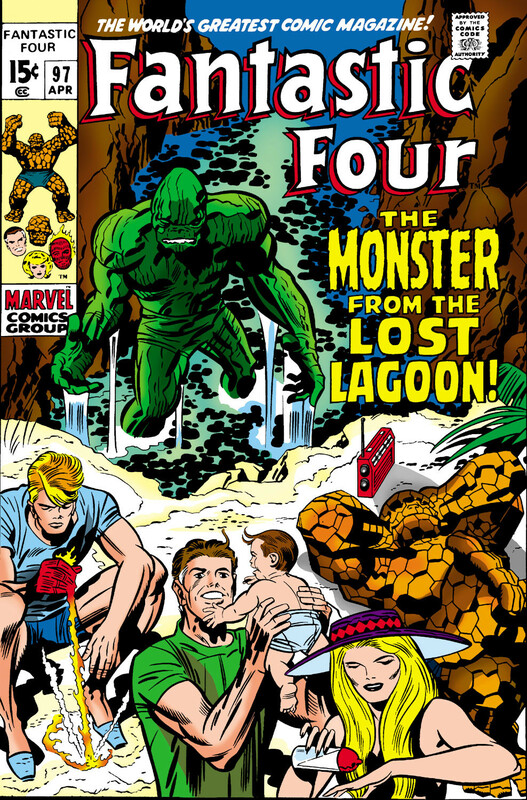 Doug: Overall, this was a fun story for what it was -- just Kirby cutting loose, Stan with his typical Silver Age characterization and dialogue, and characters we love. We've said it before -- this is like a well-worn pair of jeans, just really comfortable. And heck -- it took over 20 minutes to read! What more could one ask for? Where Did the X-Men Go Wrong? Karen: Thanks to regular reader and poster Edo Bosnar for today's topic. Recently we've discussed the Claremont/Byrne/Austin X-Men run through posts and comments, and it's been given high praise of course. But as time went on and the book and its own X-universe grew, it became a lost cause for some of us. Karen: I think that the biggest problem for me is the book seemed to cave under the weight of itself in later years, as so many characters and their individual backstories were incorporated into the X-Men mythology. Maybe part of the issue was that Claremont stayed on the book so long, too. It just seems like every character's history became hopelessly complicated. That started with Claremont, with Cyclops suddenly finding out his father was still alive and the member of an intergalactic band of rebels, and Nightcrawler discovering that his girlfriend was his step-sister (ugh), Colossus finding that his little sister had been kidnapped by a demon and returned to Earth a teenager...and so on and so on. Nobody in the X-Men universe has a straight-forward background. Karen: As Edo mentioned in his comm ents, the "Days of Future Past" story also set up a possible future for the X-Men, and this idea came to dominate the title for some time, with characters like Bishop,Cable, and Rachel Summers showing up. I recall at the time getting pretty tired of all that stuff. I'm fairly clueless about things that happened after 1992 or so. All I know is that I've tried to get back into X-Men several times over the years and I couldn't figure out what the heck was going on. I've managed to return to other titles without too many problems. But X-Men remains completely impenetrable to me. Doug: This one's inspired by a comment frequent reader Redartz posted on our Walt Simonson Spotlight last week. He related a short anecdote about meeting and visiting with Simonson at a con when he was 16 (Redartz, not Walt). Today we'd like to hear more of that sort of thing, because let's face it -- meeting one of your idols and actually spending some time with them is way cool and never gets old. Karen: Doug's asked me to kick this off, so I'll start with my meeting with Jack Kirby. 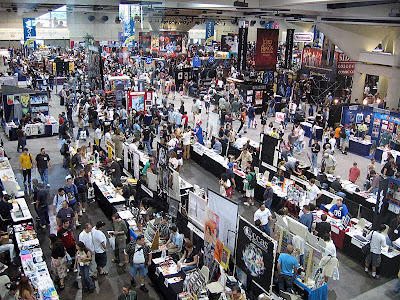 It was at the San Diego Comic Con in 1975 -I was 10 years old, and a pretty quiet kid. I saw Kirby sitting at a table, with relatively few people around. Even though he had left Marvel before I started reading comics, I knew very well who he was from all of the reprint books Marvel put out. So I was, of course, in awe of him. Mom encouraged me to go get his autograph. He was very friendly, asked me my name and if I was having fun. I probably gave him just a word or two in response. Then he asked me who my favorite comics character was. Now I was ready to talk! I enthusiastically told him that my favorite was the Thing. He said the Thing was his favorite too! He was really wonderful and left a great impression. Karen: In recent years I've had the opportunity to interview several comics creators that I grew up reading. I've spoken with Gerry Conway twice and he's just been a great guy both times; funny, easy to talk to, and very generous with his time. 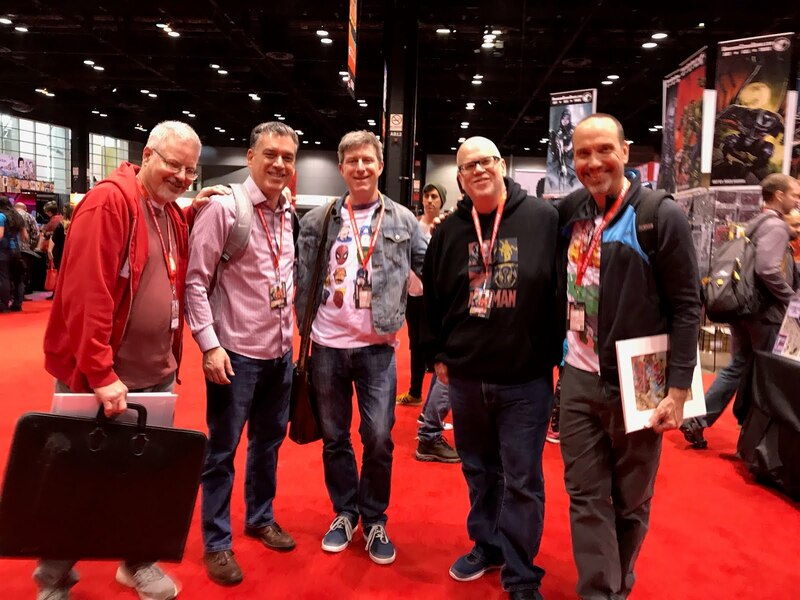 Doug: As I posted a loooonngg time ago, I've gone to the Chicago Comicon (later Wizardworld Chicago) and various other shows and appearances meeting creators and getting some autographs. Four legends stick out in my mind: Stan Lee, John Romita, Sal Buscema, and Alex Ross. 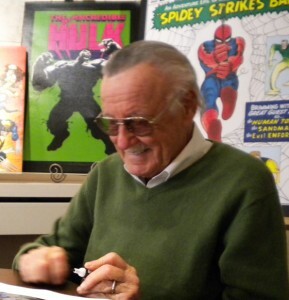 I met Stan only briefly -- if you've ever been to a con where he's been the guest-of-honor, then you know the lines that form when he is going to sign. Even though I waited for a long time, and only got to exchange a pleasantry or two (mainly I just thanked him for everything he'd done for me -- and I mean that), I was just so amazed that the guy we now see on television, that boisterous huckster, was evident even at the signing table. Stan just seemed genuinely excited to be there and to meet his fans. A great experience. 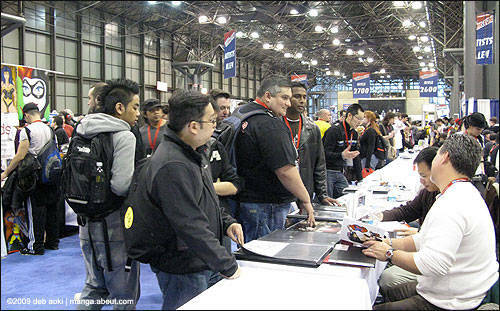 At the same con I met John Romita and Sal Buscema. They were at a table at the Marvel booth, seated next to each other. What a couple of gentlemen. I can't say enough about how kind they were, like a couple of grandfathers (which they were) -- very warm. At the time, which was maybe 2-3 years before John Buscema passed away, I ribbed Sal about bringing his big brother with him next time. 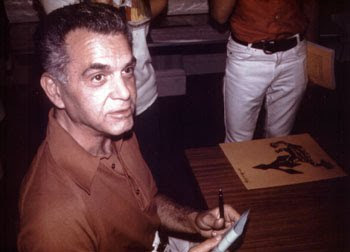 Doug: I later met Romita at an art gallery in the Gold Coast neighborhood in Chicago. He was appearing in promotion of the Spidey/Green Goblin lithograph that he had drawn and Alex Ross had painted. My friend Don Kramer and I went up to meet John. Again, he was just such a warm guy. 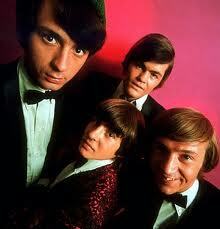 Don and I were the only fans there at the time, so we had John's full attention, and he had ours. I bet we chit-chatted with him for 15 minutes, and it was just a great, great experience. And speaking of Alex Ross, Don and I first met him at a small show near O'Hare airport right after Marvels #1 was released. That was back in Alex's longhair, long beard days! He was very humble, and who knew at the time the superstardom that was about to be his. He signed a few things and Don and I visited with him for a few minutes. Years later, Alex had a gallery show in Chicago and Don and I went. By this time I'd met Alex several times, and Don had even been to the Halloween party that Alex hosts every year. So it was a bit more personal. Maybe the coolest thing about that trip was the presence of Alex's dad, Clark -- the model for Norman McCay in Kingdom Come. I'll admit, that was a little weird, seeing a 2-D character come to life! Doug: Share an experience you've had -- and I suppose if you had a negative one that disappointed you, add that in as well. Thanks in advance, and again thanks to Redartz for the idea. Doug: We are entering the home stretch of this race through the Bronze Age of comics. As we've discussed several times around here, there's certainly a debate concerning the ending date for the era. I've posited in the past that one of my indicators is the advent of the mini-series; we saw that last year from DC with the publication of The World of Krypton and The Untold Legend of the Batman. We'll see how that genre evolves this year. Out in the "real world", Iran released the American hostages (held for 444 days) on the same day Ronald Reagan was inaugurated as the 40th President of the United States; only two months later Reagan would be shot in an attempted assassination. Sandra Day O'Connor became the first woman on the U.S. Supreme Court, and Raiders of the Lost Ark and An American Werewolf in London entertained us. In June the first cases of AIDS were reported and Superman II flew into theaters, and one month later Lady Diana married Prince Charles. 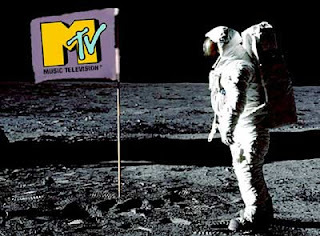 MTV debuted in August, and a month after that Simon & Garfunkel performed in the "Concert in Central Park". In December, Muhammad Ali fought for the last time. Karen: '81 was a heck of a year. I vividly recall watching on TV -and I believe it was shown split-screen style - as the hostages were released just as Reagan took the oath of office. Strange days indeed. Doug: DC Comics rolled out their third mini-series in January with the release of Secrets of the Legion of Super-Heroes #1. Of note in this three-issue series was the revelation that Chameleon Boy was RJ Brande's son (!). At Marvel, the year began with the "Days of Future Past" storyline in X-Men #141 -- a story that introduced Rachel Summers. Elektra, created by Frank Miller, made her first appearance in Daredevil #168. The very next month saw the Legion involved in another exciting development, but only because LOSH #272 contained one of the 16-page comic inserts showcasing a new book prior to its release. In this case it was the updated Dial "H" for Hero, by Marv Wolfman and Carmine Infantino, and would feature stories derived from real fan suggestions. Detective Comics #500 was cover-dated in March and featured an all-star cast of creators telling seven tales of the DCU's detective-based characters. Karen: We've had a lot of discussion in the 1980 post about X-Men and "Days of Future Past", and its effects on the title for years to come. I have to say though, that at the time, it felt innovative and exciting. It was also basically the last hurrah for the Claremont/Byrne/Austin team -one last great storyline before they split up. I never felt the book was as strong again. As for the Chameleon Boy reveal in Legion, it never made any sense to me. 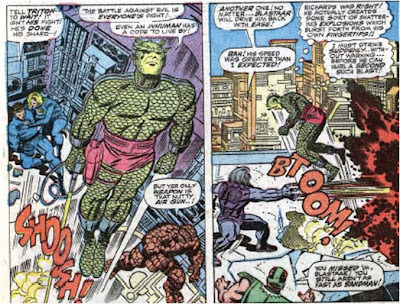 Doug: In April the Soviet Super-Soldiers were introduced in Incredible Hulk #258, by Bill Mantlo and Sal Buscema. Spring saw yet another DC mini- when Tales of the Green Lantern Corps #1 arrived. Popular GL artist Joe Staton combined with Len Wein and Mike W. Barr to tell the story. Green Lantern was also integral in introducing the Omega Men in GL #141. Karen: The Omega Men! I haven't thought about them in years. I can't recall much but I know I bought the series for a short time. The Soviet Super-Soldiers were fun, although they were arriving on the waning years of the USSR. It would have been fun to see such a group back during the Stan Lee days, when it seemed like almost every super-hero fought communists at some point! Doug: Were there any holdovers from Stan's days? Were the Crimson Dynamo and the Titanium Man in the Soviet Super-Soldiers? Doug: Summer was a time for a semi-key introduction when Vixen made the stage in Action Comics #521; she'd be a key member of the JLA as that title headed toward cancellation with the publication of Crisis on Infinite Earths a few years hence. In July Marvel and DC collaborated for the third time in Marvel Treasury Edition #28; Superman and the Amazing Spider-Man teamed up to defeat Dr. Doom and the Parasite. The story also included the Hulk and Wonder Woman, and was pencilled by John Buscema. In September, the three-issue Krypton Chronicles #1 came out. The series featured Superman discovering details of his family tree. All-Star Squadron #1, by Roy Thomas and Rich Buckler, debuted a series based around the Justice Society of America and set in WWII. For July-September, The Marvel Chronicle lists only the introduction of The Hand in Daredevil #174. However, in a small box under that entry, we find that Spider-Man and His Amazing Friends (which introduced Firestar) was on the air in September, 1981. Karen: That All-Star Squadron #1 cover is such a classic. Doug: As summer gave way to autumn, DC and Marvel teamed again to release DC Special Series #27 featuring a battle between the Hulk and the Batman, and the two heroes together against the Joker and the Shaper of Worlds. At the House of Ideas, about the only book of note at the end of the year was Avengers Annual #10 (which actually doesn't have a month of release noted), which introduced Rogue. That's it. So I have to ask, what the heck was Marvel doing in 1981? You can tell that the focus was moving to a) the X-Men, and b) creators. Miller's work on Daredevil, even though it tended to have no further impact on the greater Marvel Universe, was cited almost every month. I left out the introduction of Stick above -- if you care, it was in November in DD #176. So we basically got a blow-for-blow of Matt Murdock's life with ninjas. But what really happened that was innovative? Karen: It does seem like a pretty blah year again, doesn't it? I have to admit I didn't understand some of these Marvel/DC team-ups. Batman and Hulk? OK, I guess Hulk was a comparable seller to Batman? Just seems like Batman/Captain America would have been the obvious choice, or Spider-Man/Batman. 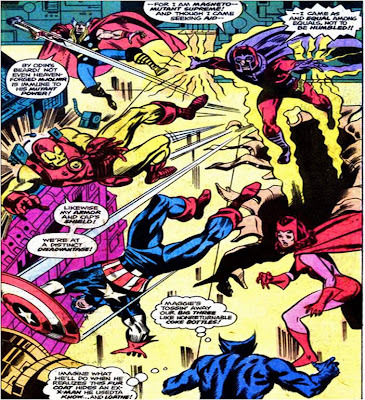 Avengers Annual #10 was a strong book, as it served as Chris Claremont's soapbox for condemning Ms. Marvel's treatment in Avengers #200. Boy did he lay into the Avengers -and by proxy, the team that produced issue #200. Miller could get away with completely re-creating Daredevil because it seemed like no one -not fans, not creators -really cared about the character! He certainly changed that. Justice League: Classy or Jazzy? Spotlight On: John Romita, Jr.
Spidey's Zoo: The Grizzly, part 2!